This is another in the Branches series (yes, I'm going through the whole stack) and I have to say this is probably the one I like the least. Prepare for totally biased reviewing. Kiki is at first delighted when a new girl moves in next door, but after they get off on the wrong foot it seems like nothing can go right for her, even with her bffs Coco and Lulu by her side. It takes a little compromise from everyone for the misunderstandings to be cleared up, and there might even be a new member of the Lotus Lane Girls Club in the future. While there is an obligatory reference to the "mean girl" in school, if you look at the story...Kiki is the mean girl herself. While she does initially apologize to Mika, the new girl, when Mika doesn't immediately fall in with Kiki's clique, Kiki gossips about her, blocks her out of her clique, tries to get her in trouble at school, and generally makes it clear that she feels her position as queen fashion bee is threatened. Even at the end when she makes up with Mika, she doesn't give any indication that she's really thought about her actions and would behave differently in the future. Basically, she's a snotty little brat who doesn't understand any perspective outside of her own. The nods to other cultures appear to just be there as window dressing for the story, much in the manner of different costumes the girls wear. Kiki's vintage fashion doesn't disguise the fact that she and her friends pretty much get whatever they want in the way of consumer goods as well. Um, no I did not like Kiki. While her behavior is pretty typical for lots of 7-8 year old girls, it's not something I'd feel comfortable recommending. 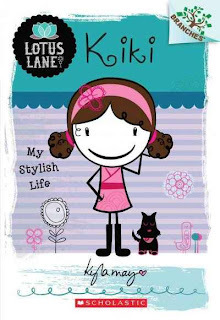 Readers will be too young to really think about the story, and as it's in diary format and all from Kiki's perspective, it doesn't do a good job of making the reader think about Mika's persective, or the other kids in class who are always secondary to Kiki's drama. The book is designed in diary format, like a notebook, with lots of small drawings and illustrations. Kiki is very fond of catch phrases and exclamations, which annoyed me, although some of that is a personal thing. I also have to say that I find the smiley face characters rather creepy. Verdict: If you have incipient Clique or Gossip Girl readers, they will probably love this series, especially if you live in an area where you have lots of upper middle class mini fashionistas. On the other hand, I can see some parents objecting to this series and it's not unique or interesting enough that I feel it's a necessary addition to the library, so I feel ok in not purchasing it just because I don't like it. Scholastic has debuted a new series of beginning chapter books called "Branches". They're intended to be a bridge between easy readers and beginning chapter books. They're illustrated, small format chapter books under 100 pages. Missy loves unique outfits, but her mom doesn't always agree with her sense of style. When her mom takes away her carefully selected picture-day outfit and replaces it with the most boring outfit ever, Missy goes to school in an awful mood. However, a new friend and some clever last-minute thinking save the day and she gets to be a little fancy after all. This is the easiest of the new series titles in this collection. It's only 72 pages long and heavily illustrated in full color. It's more of a graphic blend chapter book, with panels, speech bubbles, and only short paragraphs of separate text. The illustrations are very colorful (those that were finished in my galley) and there's lots of cuteness. The hardest thing with this book is figuring out exactly where it would go. It's a little long for an easy reader, too short for a chapter book and not quite a graphic novel. I'd probably put it in easy readers, which is where I put my Toon books. 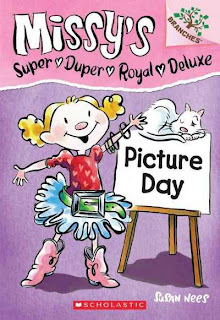 Verdict: This is a cute idea, but there are already so many picture books/chapter books out there about girls who like glitter and pizzaz it's hard to see what this book adds. It also vibes rather young, say kindergarten level, but not many kindergarteners can read at this level. 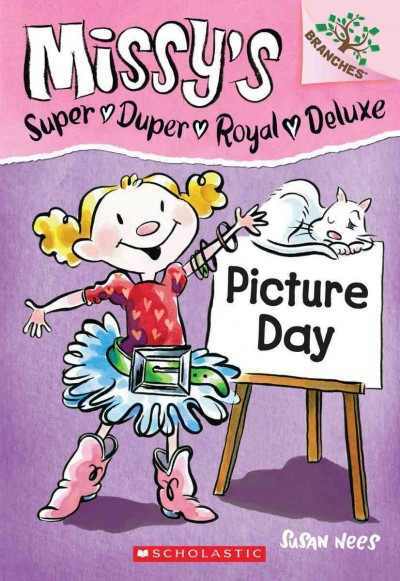 Unless you have a section that's just beginning chapter books, I'd recommend buying extra copies of Fancy Nancy and skipping this one. I really like the combination of gardening/cooking books that DK produces and I've not yet found another publisher with a similar offering. However, this new series from ABDO's Checkboard How-To Library comes close. There are actually six volumes in the series, but I just picked two to look at, Cool Basil and Cool Green Beans. Each book has the same basic components, but they're changed a little for the different subjects. The books open with a page on why you should grow your own food, then an explanation of the main subject food and some samples of different types. As a side note, I had no idea there were different kinds of basil. There's lemon basil! I want some! Unfortunately, you need sun for basil and I don't have any. There's a nicely detailed guide on how to grow the items in a container. The green beans guide suggests fertilizing, but doesn't give any details on specific fertilizers or organic vs. chemicals. There's a quick Q & A with what to do if your plants get a disease, don't produce beans, etc. Once you've followed the directions on the harvesting page, it's time to move on to the cooking. It starts with a pictorial "cool ingredients" guide. 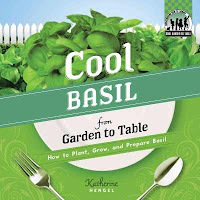 Cool Basil includes simple instructions for making pesto on this page, Cool Green Beans includes an allergy warning. Kitchen tools come next and cooking terms. I noticed they changed the photographs and instructions slightly on these, so they're adapted to the specific ingredients and not just copied over from book to book. Cool Basil includes recipes for basil parmesan dip, pizza Margherita, tomato basil soup, Thai noodles and basil, cheese & pesto Sammy, and basil-lemon cake. 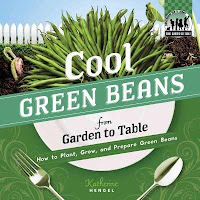 Cool Green Beans includes recipes for sesame green beans, green bean penne, green bean salad, bean & ham soup, green bean casserole, and citrus zest beans. Each recipe lists ingredients and tools, has clip art indicating if a hot stove or sharp knife will be used, and includes simple pictures illustrating the steps in the recipe. The books end with an encouragement to keep growing and cooking your own food, a glossary, and index. Verdict: There's a lot of information packed into these 32-page volumes and they're very nicely organized with a nice variety of recipes. If you are looking for more gardening/cooking books, these are probably your best bet, but they are fairly expensive, as are most library bound titles especially from ABDO. If you buy the whole set at once, it works out to about $22 per volume which always seems a little much to me for any book under 50 pages. However, they're very attractive books and I think we'll get a lot of use out of them at my library. I plan to purchase them next year in the spring. For the past couple years I've run a Scholastic bookfair on the last weekend of summer reading. We usually end up with about 500 Scholastic dollars, which I then use at the big warehouse sales to buy books for summer reading prizes (and sometimes to add to the collection). Last year was particularly exhausting and I always have a hard time finding enough volunteers to cover the fair, so since we were ending programs early in May (and a better decision I have never made) I decided to run it for a week in May and convince our circulation staff to try putting the cash register at the circ desk. Monday - Came in a little past 8 to finish setting up the fair and get the cash register set up. Sent out all the rejection emails except for my top 3 candidates for the youth services aide job. Please, please don't let anybody come back and yell at me this year...Left around 10:30 - no sales yet. [interlude for errands, breakfast, staring at the garden, skimming feedly, and doing some dishes] Went back to work a little before 2. We did maybe $100, $150 in sales? Had problems with the cash register - I think I need to get rid of all the pencils and stuff, it's too hard to deal with and that would be one less thing to worry about. Also need to close the fair down before the library closes so we aren't trying to close the library, check out last minute books, and run the register for last minute purchases. We didn't leave until past 8pm. Feeling vaguely unsettled. I blame the weather, which can't make up its mind whether we're going to have heavy storms or not. Wednesday! Remembered before I left to clean out my closet - my landlord is making a hole and running a pipe through from the basement. I do not totally understand this, but he is a good landlord and I'm sure he knows what he's doing. It was a relatively peaceful day (enlivened by the sudden activity of the hamster - why he suddenly started running around like crazy we do not know) until the afterschool crowd. We are all, kids and adults, ready for school to be over and that is reflected in the mutual exasperation. We want the kids to wait somewhere else for two hours to be picked up; the kids don't see why they can't hang out at the library. I would like to ban a certain group of older teens I am morally certain are responsible for a recent rash of vandalism (including a number of anatomical drawings) but I haven't caught them yet, so I spent quite a while glaring at the security camera screen. I think we only sold one thing all day and I found items stolen from the book fair upstairs in the teen room. This may be the last year we do this. Thursday! Alas, I did not get to work in the morning when the computers were down for updates and replacements. Nothing I like better than telling people there is no internet...I came in around noon and holed up in my office to prepare for my school visits. Checked the bookfair totals and we have only sold $350, of which we get a small percentage. Then around 2pm the 911 call went out and the police came (hey kids, don't do drugs or you too may be dragged out of the library flailing and making sounds like a dying octopus after having hallucinations and assaulting someone) and the updated computers didn't mesh right with the printers and then there was a whole involved and so far endless thing with a kid who stole another kid's library card and omg it's definitely a full moon. And I worked the desk in the evening until closing. By the time it was close to closing I told the last couple kids I didn't care if they tested their paper airplanes in the teen room as long as they were quiet. It was that kind of day. Saturday! I came in around 11 to finish preparing for my school visits and pack up the bookfair. Spent a couple hours cutting things with my massive new donated paper cutter. We made a massive total of about $300. Not worth it. My first thought when I saw this cover was "Andi Watson's Gum Girl has come to the US! Shriek!!" But no, this is a gum-themed superheroine but quite a different story (and author). Gabby Gomez is obsessed with gum-chewing and after a very hairy accident, her mother declares "no more gum!" 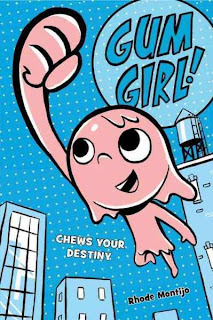 Gabby disobeys her and chews one last piece of very special gum...but the bubble blows into an electric wire and to her horror she finds herself turned into Gum Girl! Literally. She figures out the trick to turn back into her normal self (You know what gets gum out of hair? Well...it's a good thing she's not allergic to peanuts.) and decides to fight evil as the super-stretchy Gum Girl. Unfortunately, as many a superhero has discovered, it's not so easy to balance superheroing and school and Gabby finds herself getting into more and more trouble. In the end, she has a decision to make - tell her mom the truth or keep getting into trouble. But there's a mysterious villain on the horizon who might cause even more trouble...yes, this book ends on a definite cliffhanger! The art wasn't finished in the galley I saw, but I was told it would be in color similar to the cover (I think, I might be remembering something else?) It has very thick lines and a Cartoon Network look - makes me think of the Powerpuff cartoons. Verdict: While I would really prefer Andi Watson's Gum Girl, I think this will definitely have appeal too, probably to the same crowd that likes Bad Kitty and similar titles. It feels much more American of course, and has some of the typical stereotypes - big and strong equals bad and stupid bully, etc. It plays with some superhero tropes, but not enough to be really amusing. In short, it's a title quite a few kids will like, but adults won't be much interested in - and that's ok! I don't usually tantalize you with books you can't have, but I'm going to review something on Friday that needs you to know about this first. I am a big enough fan of Andi Watson's graphic novels to purchase them from Book Depository or Amazon.co.uk for my own collection. 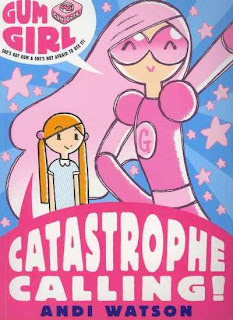 I particularly love Glister, although I can see that it wouldn't have wide appeal to most US kids but for a great graphic novel that kids would love, I recommend US publishers take a look at Gum Girl. Grace is a normal girl, worried about moving to a new town and especially about her dad being the headmaster at her new school. Then she gets a good look at the town...and she's really worried. Her parents think living in Catastrophe with giant robots, an active volcano and a general population of supervillains is an awesome idea. Grace thinks they're insane. However, a little playing around with her chemistry set, a few gum-themed accidents and suddenly she finds herself making the decision to become Gum Girl! Armed with her super gum that can do all sorts of amazing things, she decides to help the ordinary citizens of Catastrophe and fight back against the mad scientists and supervillains, even though the other kids in school warn her that nobody ever helps anybody in Catastrophe. There's a happy ending for all and a hint of more adventures to come for Gum Girl! Watson's art is full of bright colors and funny jokes. I love the pixel art on some of the clothes and scenery and the little jokes mixed into the giant robots. The book itself is a large format paperback - about 10 x 6 inches - so there's lots of room for the panels and a text that's a good, readable size. There's a lot of pink, but not so much that boys will be reluctant to pick up the book. Grace aka Gum Girl is an awesome female character who's smart, independent, and inventive but not afraid to ask for help when she needs it. Verdict: I love the mixture of Saturday morning cartoon superheros/school friendships and snarky byplay amongst the students. If only someone would publish this in the US, maybe change a few expressions like "headmaster" and "plaits" I can guarantee it would give Babymouse and Daniel Boom a run for their money, at least in my library. If you're fortunate enough to be able to purchase it from the UK, go for it! ISBN: 9781406329391; Published by Walker; Purchased for my own collection. I noticed in Firefly Books' latest catalog a notice that they were reprinting this series and thought it looked worth reviewing. I borrowed an older copy from another library and this was a definite find. 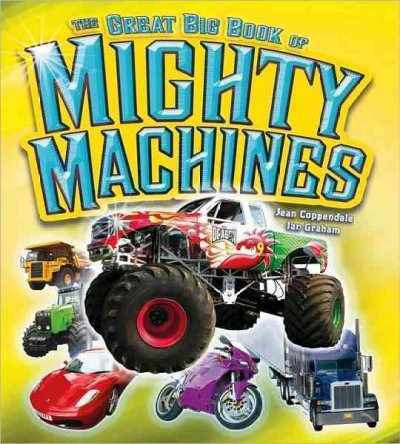 The Great Big Book of Mighty Machines is actually a collection of several individual books, like the Tractors book pictured below. It is over 100 pages and includes Bikes, Cars, Trains, Tractors, Fire Trucks, Dump Trucks and Monster Trucks. Each individual book in the collection has a border of a different color, which can then be matched to the glossaries in the back. The index covers the entire book. 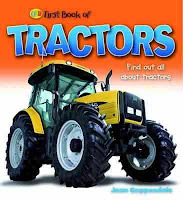 Each book opens with a simple explanation of the vehicle and how it works, then moves on to different types of vehicles and how they are used. There are additional facts scattered throughout the books and each volume ends with simple activities, mostly identifying pictures and writing prompts. The writing...these are the machine books I have been looking for my whole life. 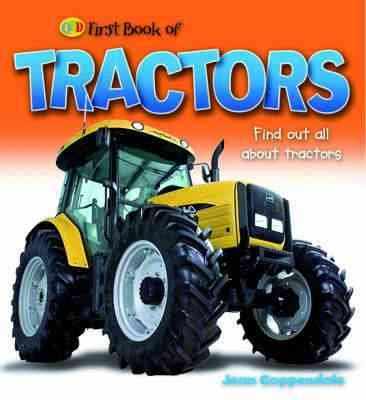 I am swoony over their tractor descriptions. Seriously. The language is simple enough to read aloud in storytime or to a small machine-obsessed child, but it includes a lot of facts and information. Interesting enough and well-written enough that it's not a bore to read, but using simple vocabulary that beginning readers could tackle with a little help. These books are amazing. Verdict: Several of the individual titles are still in print and I am planning to purchase both the collected volume and the individual books. I heartily recommend you do the same. It's going to be a happy day when I weed our outdated machine books and replace them with these marvelous volumes. More interviews - I have to make a decision this weekend! I knew it was going to happen sometime - a kid dropped his library card down the wishing well. Small preschool that visited in April came back to drop off their books and check out new ones. Yay! Presentation for United Way - they're funding my Rubber Ducky Readers this year and I am hoping will fund it going forwards into the future, among other things, and while my director would normally go she wasn't available. I wasn't really sure what they wanted, but I hope I didn't get us kicked off the funding list. I have enthusiasm, but no real knowledge of the workings of the library budget. Oh well, I did my best. Finished planning summer programs, at least to the extent that I ordered supplies from Discount School Supply and went on a Walmart trek. Last week of outreach visits to the daycare I visit every month - I will see them twice this summer, and then we'll go back to our usual schedule next fall. It's definite - our town's small Catholic school is closing. I'm pretty sad about this as I just got resource sharing off the ground with them this year and I always enjoyed having classes come over for field trips and to use the library. It was a nice school, but with only 58 students I can understand that they couldn't continue. Scholastic booksale arrived on Friday and I was grousing that I was going to have to work extra to set it up and this Saturday would be the second in a run of three that I have to work when I realized...I have an aide! Who is pretty awesome! And doesn't have a game after school on Friday! Guess which high school student is setting up the fair...of course, I still have to work 3 Saturdays in a row and some interrupted shift days which tend to turn into 10-12 hour days, since it hardly seems worth it to drive 20 minutes home, spend an hour or two there, and drive 20 minutes back to work. I underestimated how long it would take to set up the fair - next year I need to either not work on Saturday so I can come in all day Friday or get more volunteers or have them deliver it earlier. Or something. Anyways, it wasn't done and I was so starving I didn't want to stay any longer than 15 minutes after we closed, so I'll have to come in early Monday morning to finish setting up. I also had my yearly evaluation this week. I will admit to being deeply relieved that my director did not have time to put together the library-centric evaluation she has been talking about adding to the city evaluation. Not that I have anything against the idea per se, it is not a bad one, I just want her to test it on somebody else! Anyhow, we also discuss goals and kind of go over the year and discuss any concerns and plans for the future. One of the things we mostly talked about was the future of Preschool Interactive, i.e. preschool storytime. I've worked hard on this program and it's been a big success since I debuted it in summer 2011. But when I found out four-year old kindergarten was going to five days a week starting in fall 2012 I saw the writing on the wall. Sometime around mid-April, Pattie and I looked at each and admitted what we'd both been hoping wasn't true - the three year olds are gone. The spring numbers were still passable - average of 21, which is more than 10 kids, our overall attendance is about equal to last year, our circulation is still up from last year, but it may be time to let this program go. 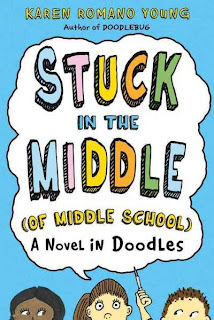 This is the sequel to Doodlebug, which tells the story of Doreen (Doodlebug) and her family who have to move when she gets kicked out of school (long story, involving ADHD meds). In this story, there's lots of little problems as they all adjust to new schools, new friends, and new jobs. 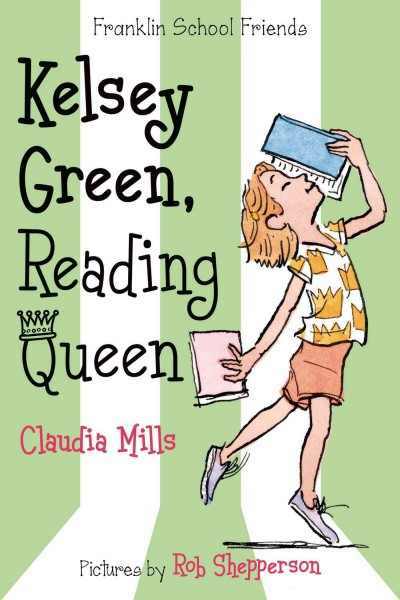 Most of the tension in the plot comes from her dad's struggle to find work and be comfortable with her mom's success and Doodlebug's younger sister's clash with the queen bees at her new school. This is written/drawn in the style of Amelia's Notebooks by Marissa Moss, with lots of speech bubbles, doodles, and odd fonts all crammed in together. I have to admit, it drove me crazy trying to read it and this is one notebook novel I probably wouldn't hand to a reluctant reader, usually the top audience for these titles. However, the first book has done quite well at our library and if you can get past the extremely busy format there's a strong story, dealing with real issues, in the book. I especially found the interaction between Doodlebug and her teachers to really strike home. I can see a lot of my after school middle school crowd acting in exactly this way and dealing with many similar problems at home. 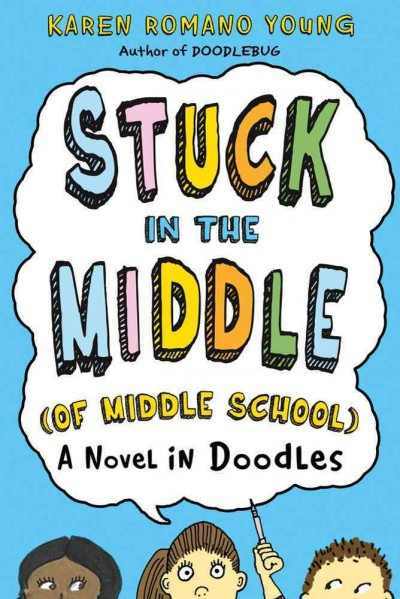 Verdict: With a little booktalking this will appeal to a more mature, older middle school audience than Ellie McDoodle or Dork Diaries. I think I'd emphasize how Doodlebug deals with her problems rather than the humorous aspects of the book as that's likely to pick up a more appropriate audience for this story. If you have the first book, you'll probably want to add the second. 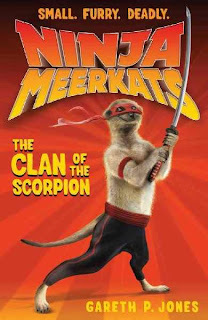 I love this cover so much, from the smirk on the meerkat's face to the excellent subheading above the series title that pretty much booktalks the whole book for you, it is sheer awesomeness. Sadly, these cool British/Australian series with quirky plots never seem to be as popular as I think they will be, but I plan to give this one a generous chance at success. The Clan of the Scorpion, four tough ninja warriors, set out on a mission to thwart the plan of the evil Ringmaster. Yes, there are evil clowns in this story. 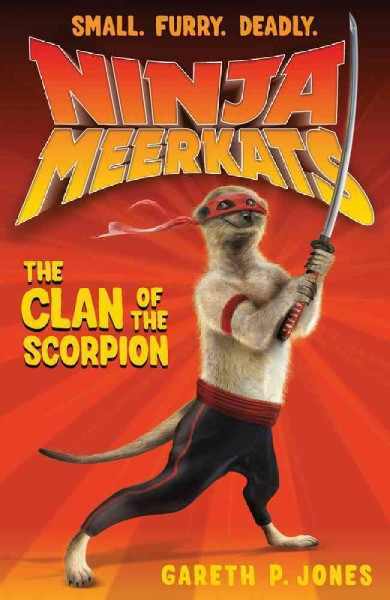 The meerkats are all martial arts experts and are led by the smart and quick-thinking Chuck Cobracrusher. The other three members include the super fast and hungry for glory Jet Flashfeet, Donnie Dragonjab the inventor and "master of gadgets" and Bruce Willowhammer, the not-too-bright required muscle. They are guided by the ancient Grandmaster One-Eye with his mysterious Meerkat sayings. On their adventures they encounter evil acrobats, diabolical poodles, inquisitive children and are forced to use some clever disguises. Of course there are many hilarious moments and sudden twists and turns. My favorite quote, "Hong Kong has one of the deepest harbors in the world, so Bruce had plenty of time to reflect on his life as he and Jet sank to their almost certain death. Mostly, he found himself regretting not having eaten more." Verdict: This series may not have staying power, but its wacky adventures and silly humor will entertain quite a few kids. If you need more beginning chapter series, it's definitely worth considering. I can't remember where I saw this book recommended, but this Australian import definitely seems to have slipped below the radar. 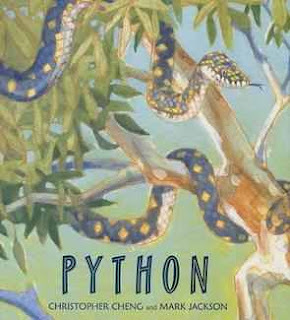 Simple paragraphs follow a female python through her hunt for prey and her life cycle. She basks in the sun, sheds her skin, stalks prey and catches a meal. Eventually she lays and incubates her eggs and when they hatch she moves on. Each spread also contains facts about pythons; when they python is stalking a rat, the story reads "The rat stops. He scratches the ground and moves a little closer, looking for seeds to eat. Python waits no longer. Dinner!" and the factoid section, in smaller print, says "Pythons are constrictors. A python doesn't crush its prey; instead it suffocates it. (Broken bones would make it harder to eat.)" The art is mixed media, swirling colors and shapes someone on white backgrounds, some set in jungle-like settings. On the one hand, I prefer photographs in nonfiction and and illustrations are sometimes hard to decipher. On the other hand, given the number of annoyingly squeamish parents I have to deal with (yes, I know some people have a genuine fear of snakes but I personally can't help feeling that all that girly squealing is ridiculous and just because you are scared of snakes and spiders doesn't mean you have to pass down your own phobias to your children) a little blurriness in the artwork is a Good Thing. This book reminded me a lot of Wolfsnail in the simple, matter-of-fact text following the basic habits of a single animal. It is a little more text-heavy, although still a perfectly good read-aloud and I'd probably use it with a slightly older audience. Verdict: Buy this one for those snake-themed outreach visits to kindergartens and first grade classrooms. Unless you have less squeamish parents than I do, I'd think twice about using it in storytime, although the picture where the python eats the rat isn't really that gruesome. ISBN: 9780763663964; Published 2012 by Candlewick; Borrowed from another library in my consortium; Purchased for the library. This week at the library; or, Last week of programs, go go go! Electrician came back on Monday - they keep saying our plugs you can't plug anything into are code. Whatever. They are broken as well and did I mention my cd player died? Two interviews for the aide position and the school librarians came to set up for BOB. Tuesday, got to work early to let in the BOB volunteers, then I just had to be available for pep talks and anything needed while I did toddler registration, corral loose/lost children and clap loudly at the award ceremony. Oh, and vacuum up a few crumbs. This is the best deal ever and if your town has Battle of the Books and your library has the space I highly recommend contacting the school librarians to see if they'd like to hold any battles in the library! Wednesday - last Preschool Interactive. Every time I think "well, this storytime is no longer tenable" I get a decent-sized group. Which would be 18, and since most parents/caregivers bring 2 kids that's mostly kids. However, I still think I may have to decide about changing storytime at some point in the not-too-distant future. Oh, and the door to the storyroom broke. Then our last middle school madness and I am never inviting the high schoolers to join us again, since they all thought it would be funny to make "legalize marijuana" shirts. WHY ME? Thursday - thankfully my director is back from her conference so I don't have to do any more long Thursdays (for a while at least). Finally made a decision on the online calendar - we are not moving to something new. Now I have to buckle down and spend several hours uploading all the summer events. Got partway through June. The last Messy Art Club was pretty simple, just lots and lots of decorating of masks. We did temporarily lose a toddler from Books 'n' Babies in the morning, but it turned out he had just sneaked into the back room to watch the guys fix the door. Went home and made cupcakes for tomorrow. Friday - stopped at the grocery store on the way to work to buy fruit. I have been getting quite small attendance at the non-performer We Explores. It could probably increase with more publicity, but I can't do more without killing myself! Anyways, I figured we'd have a fairly decent turn-out for this one and did extra prep and the program went pretty well and a nice group of people came. I think next year instead of doing "concept" We Explores I might do author ones (although I did not get good turn-out for Elephant and Piggie). I was going to go home early, but through a mix-up an interview got scheduled so I had to do that. Finally left at 4pm. Saturday - my director wanted us to have homemade muffins and I said that was fine but somebody else would need to do the baking, so she and our reference assistant and Pattie all made some. I came in around 9:30 to set up People started drifting in right away and the program went well. For the last half hour or so I worked in my office (it opens into the storyroom) since it was mostly older kids eating muffins with their parents. I thought I'd leave around noon, but another group of people showed up, so I finally went home a little after one. I really, really wanted this book to work because, you know, PLATYPUSES. But I just couldn't get into it. So, Zengo is a new detective, determined to live up to the record of his heroic grandfather, killed taking down a panda gangster. He's also suspicious of said Panda's son. Everyone else seems to think Frank Pandini Jr. is a great benefactor, but Zengo isn't so sure. He gets paired with O'Malley, a tough old-timer who's maybe been around just a little too long. There's a stink of illegal fish all over town and mysterious disappearances. Zengo is enthusiastic and doesn't think much of O'Malley, but his inexperience lands him and his partner in the doghouse - or rather, the crossing-guard house; they're both demoted. It takes a combination of both their skills to break the illegal fish ring although in the end Pandini gets away. The whole story is kind of a parody of the buddy cop trope. The enthusiastic rookie who doesn't really know what he's getting into, the cynical old cop who's seen it all and lost some of his edge. There's a kid who gets in over his head, illegal substances flooding the city, and even the sinister gangster behind it all. Of course, in this story the cops are platypuses, armed with boomerangs, the illegal drugs are fish, and the gangster is a panda bear. Verdict: It's hard for me to translate the tough cops and dark, gritty city streets of the original into the lighter feel of a kid's book. It's just too...silly. I can see kids liking the funny aspects of the story, but only younger kids and at over 200 pages this will be too long for most younger readers. Of course, I could be wrong on this. I'm not getting a really good feel for kid appeal on this one so...feel free to draw your own conclusions. 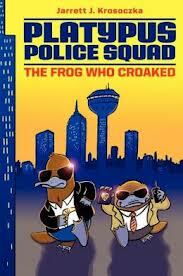 I already ordered it (b/c PLATYPUSES) and I'll booktalk it and see how it goes over the summer. I'll have to trust Krosoczka's proven track record of kid appeal on this one. Kelsey Green loves to read more than anything else - especially math class! So, she's thrilled when the principal announces a reading competition. She is sure she's going to be the best reader in the third grade and her class will win! But things don't work out as she expects when Simon turns out to be a faster reader than she is, Cody won't read at all, and her best friends are more interested in other things. When Kelsey decides Simon must be cheating and takes her friends to spy on him, things get even worse. Is she really the best reader in her class - and does she want to be the best if it means being mean to her friends? Every note in this is just perfect, from Kelsey's competitive streak that makes her lose sight of what she really loves about reading to the number of kids in the school (yay for a book that finally shows a realistic class size!) and Cody's reluctance to join in the competition. Kids will instantly recognize themselves or a friend and maybe think twice about helping out a classmate in difficulties or asking for help themselves. I'm looking forward to the sequels which will feature Kelsey's best friends, Annika the math whiz and Izzy, who loves to run. Verdict: This is a funny, sweet story that will click with both parents and kids, not to mention teachers (who may enjoy the gentle jabs at the principal!). A definite must for your library. Could Steve Sheinkin get any better? Yes, yes he could. I swallowed this book in two lunch times, reading as fast as I could and I can't wait to booktalk it. Sheinkin presents a complicated story of counterfeiters, blackmail, grave-robbers, informers, private detectives and politics and pulse-pounding prose. Historical details and context are smoothly woven into the story of the counterfeiters including current politics and the history of Lincoln's monument. After the Secret Service tracked down one of the most skilled engravers in the counterfeiting trade, the biggest counterfeiting gang hatched a clever scheme to get him back. They decided to steal Lincoln's body and hold it for ransom. While they laid their complicated plans, various Secret Service agents and private detectives were closing in on them, but few believed the rumors of the wild plot. 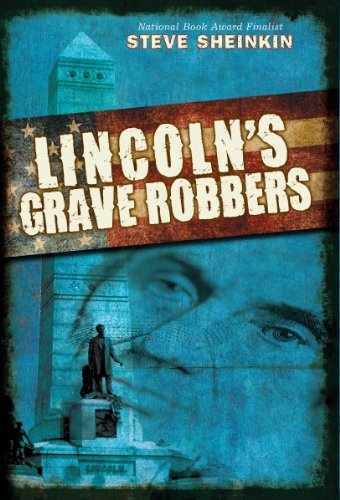 In a final showdown, Lincoln's body was saved but the gang escaped. Additional detective work was needed to track down all those involved in the plot. A final section talks about the history of grave-robbers and some of the weirder stories of their gruesome trade. There are a lot of different players to keep straight, but Sheinkin's brisk and exciting language keeps the story moving even if you have to refer back to the cast at the beginning now and then. I was reading an unfinished galley, so most of the photos were placeholders, but it looks like there will be quite a few black and white photos included. 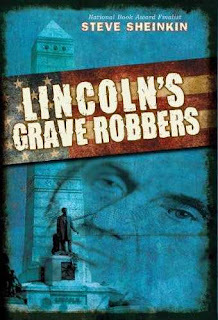 Verdict: The history buffs at my library have been big fans of Sheinkin's Bomb and Lincoln's Grave Robbers will appeal to an even wider audience with its eye-catching cover and sensational story. Sheinkin is a master at bringing history to life and making it interesting and thrilling and I highly recommend his latest work. This week at the library; or, Everything happens at once! I had Monday off, decided to use my last vacation day before my anniversary date (May 5) after all my preschool visits last week. So Tuesday was crazy! I need a vacation to recover from my vacation! The last preschool visit came, all sorts of invoice confusion, mounds of stuff all over my desk to be dealt with, the blood drive was going on, etc. etc. As I was finishing lunch at 3:30 (crazy day! I'm lucky I got lunch at all!) I suddenly realized I hadn't planned tomorrow's storytime. And the hamster bit me - I think that last round of touching with the preschoolers was too much. The eggs for Chick Central arrived on Wednesday. Pattie wanted to do duck eggs again and I said fine as long as I am not in charge of spritzing them. We have never had good luck with hatching, but at least if anything goes wrong this time I can blame Pattie - and we got Virgil in on the project from the beginning (local farmer) instead of at the end to show us everything we did wrong! Wednesday was also enlivened by the middle schoolers decided to find out if daffodils are edible. They are NOT in case you were wondering. Thursday - we had to cancel Books 'n' Babies at the last minute, but fortunately most of the parents were understanding. Most of them. Even if I'd wanted to sub, I couldn't have - the few staff we have remaining were at a local conference and there was nobody but me to cover the reference desk. Plus, I have made a rule that we don't sub for books 'n' babies, you just end up with a room of screaming babies and grumpy parents b/c You Are Not Pattie. And, of course, no week would be complete without a visit from the police. It was freezing cold and raining so only about 35 people came to Lego Club and of course the after school kids were soaked and apparently their brains got wet too, so they decided to change in the lobby and I had to yell at them that it's NOT A LOCKER ROOM. No, we didn't call the police on them, that was the other teens who were smoking outside the library and being rude to people. 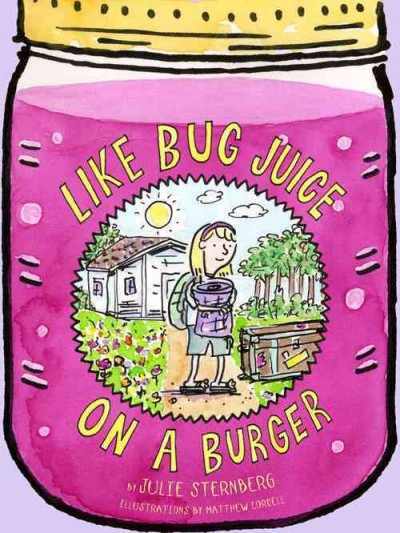 I had issues with the first book in this series, Like Pickle Juice on a Cookie. Someone did later point out to me "well, duh the text is choppy, it's free verse." My opinion is that reformatting text into looking like poetry doth not poetry make. However. I bowed to the weight of public opinion and purchased the the first book for the library where it circulated fairly well. So I agreed with myself to give the second book a chance and it turns out I liked it much better than the first one. Eleanor's grandmother signs her up for camp - the same camp Eleanor's mother went to. Eleanor is excited, especially after the fun stories her friend tells about her camp. Then she realizes she will be away from her parents for nine days. There are a whole bunch of girls she doesn't know. Everything is very...outdoors. There are bugs, the food is icky, and she gets put in the baby swimming class. She does make a sort-of-friend, the tall and weird Joplin, but after the first day she wants to go home! With some help from the camp director and her guidance counselor, she does enjoy a few things about camp and manages to make it to the end. Eleanor isn't the typical little girl of most beginning chapter books. I kind of sympathize with her dislike of camp, not being an outdoors person myself (other than a bit of gardening). She's a picky eater, sensitive, not athletic, and very much an only child, not used to living with other kids (or anyone really, since her parents are gone all the time it seems like). But she manages to stick it out and find some good things about camp after all. I liked that the author didn't do the typical thing and make her a huge fan of camp by the end "Sometimes--not always, but definitely sometimes--camp was a wonderful surprise." I still don't think much of the poetry from a literary standpoint, but it does work in this context and if the kids just see it as a shorter book, instead of thinking "oh this book is in poetry" that's ok too. Verdict: Fans of the first book will definitely want to read this one. It's also perfect for those little girls who don't mesh comfortably into a group. 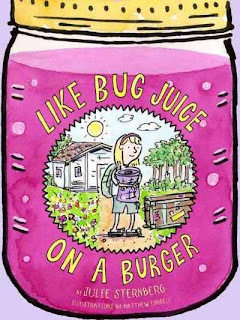 Eleanor's fears, troubles, and triumphs ring true throughout the book and even kids who like camp and sloppy joes will be able to sympathize a little with her private reactions to what everyone else thinks is wonderful. This is Wednesday; or, Don't eat the daffodils! Girls: Ms. Jennifer, we were looking for you, we have something for you! Girls: And you know what, they're edible too! Me: WHAT THE HECK ARE YOU CRAZY THOSE ARE POISONOUS!!! Me: I'm pretty sure, most bulbs are. Me: Did you girls wash them all out, nobody actually ate any? Girls: Yeah, we rinsed our mouths. But J ate a whole one. J: Uh...are they really poisonous? Me: Yes. I googled it. J: I didn't actually eat it. Much. I rinsed my mouth out. Me: If you feel sick, go outside. I am not cleaning up vomit again. Later...director kicks out J and other boys. Me: Don't let J go off by himself in case he has convulsions! Then I had a lengthy conversation with the same group of girls about why they had to wear shoes in the library, culminating in my tried and true response "If I have to explain why it's not allowed, you're not mature enough to be in the library by yourself" and I added that we were like a restaurant - no shirt, no shoes, no service. Which was a bad idea b/c they immediately wanted to know how much they had to be wearing for it to qualify as a shirt. I finally just laughed and told them to leave, so they went out and hung out on the back steps of the library, which lead to the staff entrance, so when I was leaving we somehow ended up discussing eating kool-aid and the Cinnamon Test and why we weren't going to do it at the next Middle School Madness. 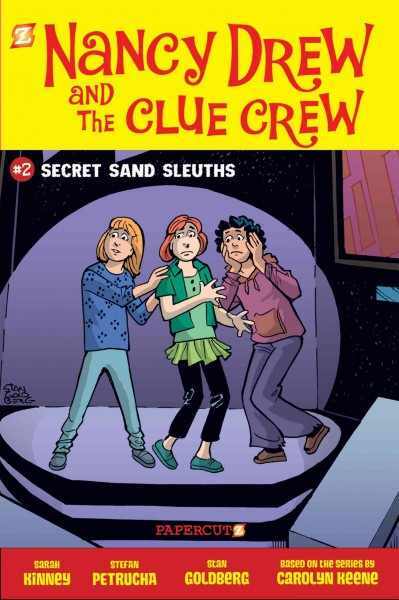 This is the second book in Papercutz' adaptations of Carolyn Keene's Nancy Drew and the Clue Crew. For those not familiar with it, this is a spin-off of the Nancy Drew series intended for younger readers and featuring a third grade Nancy Drew and friends. In this story, Nancy and her friends are on a field trip to the museum. They are disappointed to hear that the special sand mandala isn't available to see and then they overhear the janitor being fired for messing it up. Nancy is sure it wasn't her fault and she and her friends decide to find out what really happened. With the help of the artist, the Venerable Gelek, they discover the truth and learn some new things about Buddhism and sand art. This is one of those series that, as an adult reader, I have to stop every couple sentences to complain to the squirrels at my window about the flaws but that I purchase for the library because the kids love them. I've never been a fan of any of the Nancy Drew or Hardy Boys spin-offs, especially the younger ones, but I still get kids asking for Clue Crew on occasion. Our copies were random selections from the series and not checking out much, so I decided to clear them off the series shelf and purchase this graphic adaptation instead. There are some grammatical mistakes, most notably in the placement of commas, and the writing overall is a bit clunky. The art has a strong cartoon style and the perspective is a bit wonky in places, especially in the opening panels where from the text and graphics it sounds/looks like Nancy and her friends are much older than all the other kids in their class. Ultimately though, those things don't really matter. Because the book gives kids exactly what they want - a funny mystery with familiar characters, a few brief moments of suspense, and cute pictures. Verdict: Despite the literary flaws, kids will grab these off the shelf, as seen in my already more than decent circulation statistics for the first volume. I'd put these into the category of my tub books (Disney Princess, Barbie, etc.) books that will never win any awards, but kids will enjoy reading them and they'll up my circulation. Also, Papercutz has very affordable hardcovers and I suggest purchasing them in that format. ISBN: 9781597073769; Published March 2013 by Papercutz; Review copy provided by publisher; Series purchased for the library.